Today, you can get one graphic tee for only $0.01 when you purchase another at Aerpostale! 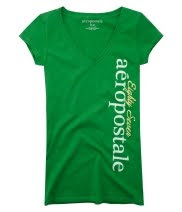 Women’s shirts are $5.99 – so you can get two shirts for only $6.00 total! When you spend at least $50.00, you can get 14% off your total order with the code 14FORU. Head on over here to start shopping (click on Girls and sort low to high to find the $5.99 tees). If you would like to get paid to shop, go through Shop at Home where you’ll earn 5% cash back on your purchase. If you are planning on shopping in the stores, head on over here and take along this printable coupon and save $10.00 off of a $50.00+ purchase.